On a recent trip abroad, we flew to and from Charles de Gaulle airport, outside of Paris. Charles de Gaulle is the second largest airport in Europe, it’s very spread out, and a bit like an octopus, with multiple terminals and hundreds of gates. Our flight from San Francisco arrived at Terminal 2G. After collecting our luggage we needed to locate the CDGVAL shuttle, and take it to Roissypole/Terminal 3 stop (we stayed overnight at an airport hotel). From the baggage claim, although we followed numerous signs through the airport for CDGVAL shuttle, there are multiple levels, up and down escalators, and soon we were going in circles. It was time to stop at a nearby information booth, and ask directions. Here’s a few tips, to make arrivals, departures, and connections easier at Paris Charles de Gaulle airport. The airport has Terminals 1, 2, and 3. Within the airport, the free CDGVAL airport shuttle goes between Terminal 1, Roissypole/Terminal 3, and Terminal 2. Terminal 2 is the biggest, with seven different satellite terminals – Terminals 2A to 2G. In addition, Terminal 2E is further divided into Halls K, L, M. Also at Terminal 2 is the TGV high speed train station, and RER train to the center of Paris. Terminal 2E, find departures check-in and security, and K gate departures. For L and M gate departures, take the free shuttle to Halls L and M.
To go between Terminals 2A, 2B, 2C, and 2D. Use the free N1 shuttle (navette) between Terminals 2A, 2C, 2D, 2E, 2F. N2 shuttle goes between Terminal 2F and 2G. At the Roissypole/Terminal 3 shuttle stop are hotels and access to the RER train. To get to Terminal 3 From the CDGVAL shuttle stop, you’ll have to walk, follow the big line marked on the sidewalk. It takes about ten minutes (especially if little feet are tired) to get to the Terminal 3. Terminal 3 is one level for arrivals and departures, in separate halls. CDGVAL shuttle arrives on the lower level, go up to departures check-in, up to next level for boarding, arrivals is on the top floor. 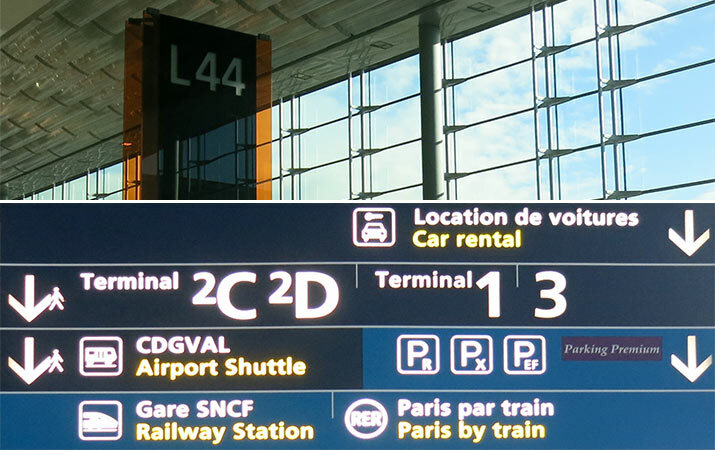 For departures from Charles de Gaulle, know your terminal number on your ticket/boarding pass. Terminal 2 also has a letter. For Terminal 2E, your boarding pass will have a K, L, or M gate number. Allow plenty of time to get to the gate. Even after check-in and going through security, shuttles and walking to your gate could take 20 to 30 min. All the terminals have cafes, restaurants, and shops (Terminal 3 is small with limited number of cafes and shops). Here’s a detailed list of services in each terminal: terminal maps. For an early departure from Charles de Gaulle airport, connecting flight (after a long flight), or are continuing your trip on the TGV high speed train, consider getting a hotel at the airport. Sheraton located is in Terminal 2 arrivals, other hotels are located right at Roissypole/Terminal 3 shuttle stop, and more hotels are easily accessible by hotel shuttle or taxi. We stayed at the Hotel Pullman, location can’t be beat – just hop on the CDGVAL shuttle, get off at Roissypole, then walk a very short distance to the hotel. The breakfast (starts at 7am) was a fabulous buffet – flaky croissant, pain au chocolat, fresh squeezed juices, cereals, eggs, crepes, yogurt, wide selection of fresh fruits; only problem, not enough time to have a truly leisurely breakfast. Check out Travel for Kids list of Charles de Gaulle airport family hotels.